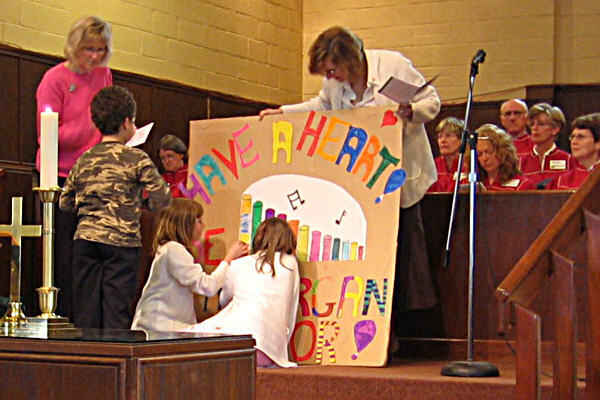 Almost two years after our 1975 Allen organ gave up the ghost during a funeral, the work of the organ replacement committee has come to fruition, thanks to the financial support of the Summerlea congregation. 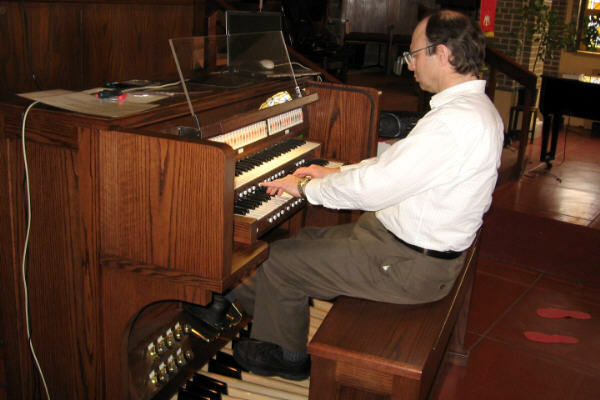 Our new Phoenix organ has been installed, voiced, used for a concert with Don Anderson of Phoenix at the keyboard, and been dedicated. 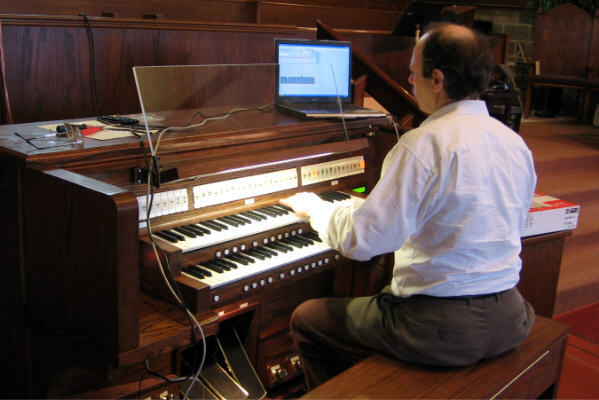 The organ is a two-manual instrument with 43 tab-type stops. 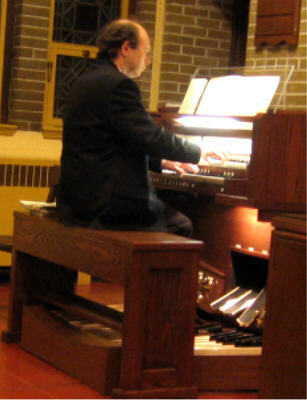 It has four specifications: English Romantic, Baroque, French and Orchestral. 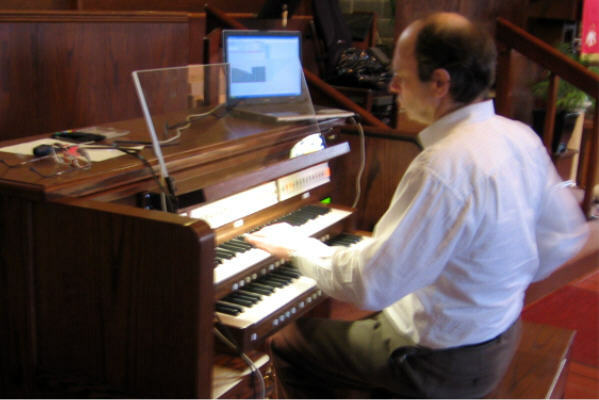 Functionally, the organ is contains a number of computer processors with a vast repertoire of sounds in memory, recorded from many pipe organs and orchestral instruments in Europe and North America. 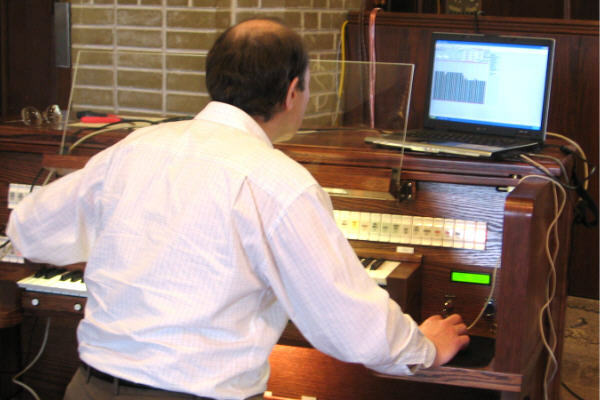 Depending on which specification and which tabs are selected, the processors respond to key strokes by choosing the appropriate sounds from memory and sending them to the speakers. 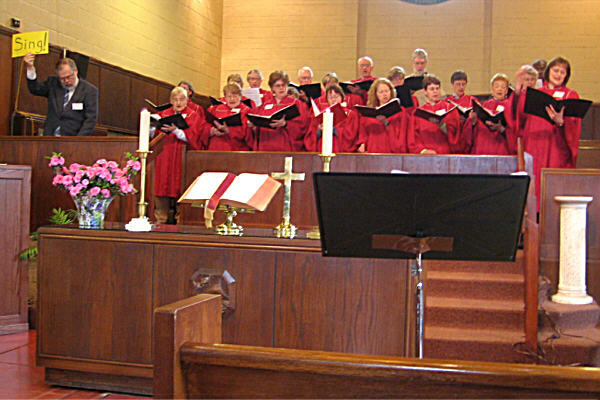 Phoenix provided a number of speakers, including four acoustic cubes and four woofers plus one sub-woofer in the chancel, and two acoustic cubes and two woofers at the rear of the church. 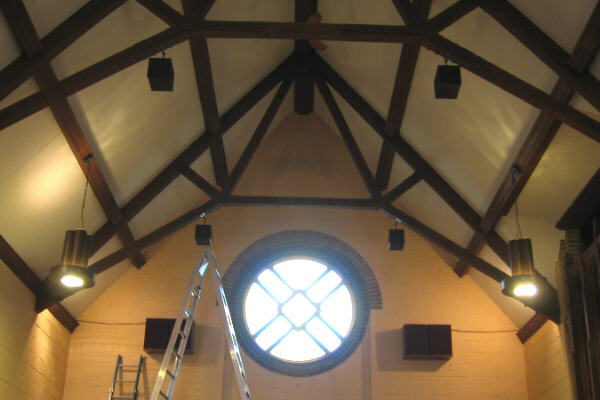 The choice of speakers and their locations is designed to provide the sound and feel of a large pipe organ in the Summerlea acoustic environment. 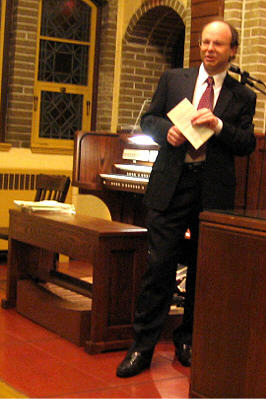 The organ arrived at Summerlea March 5, and Phoenix gave instructions to Richard Legault as to how the speakers should be installed and wired. 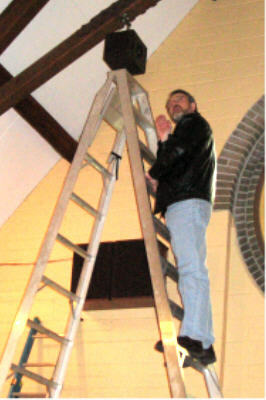 After a brief pause down South, Richard and his neighbour Léo Payette, a retired telephone installer, proceeded to install the speakers with help from Howard, George and Richard's son Matthew and friends. 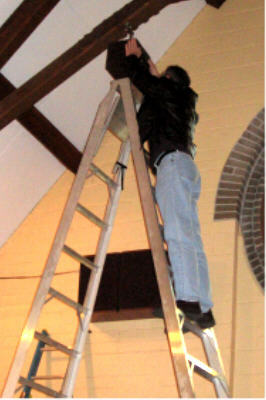 Your untrusty snapshooter was away during this phase, so we have no photos of the intrepid ladder-scalers at work. 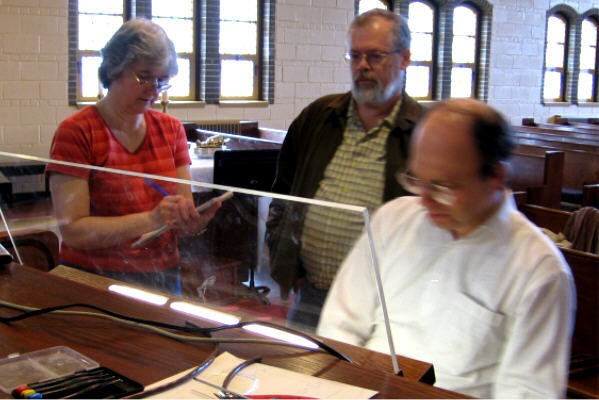 The Monday before Easter, Don and Jim Anderson of Phoenix returned to check out the speakers and voice the first specification, which they completed Tuesday evening before returning to Peterborough for Easter preparations. 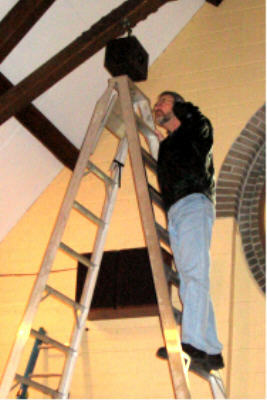 checking that the sound was coming from the correct speaker. and four woofers on the front wall. 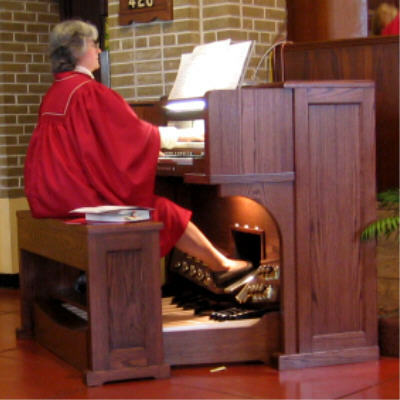 to provide the sound of the 32' pipes. listening to the sounds and viewing a bar graph on his lap top. The bar graph took on some interesting patterns that only Don could interpret. 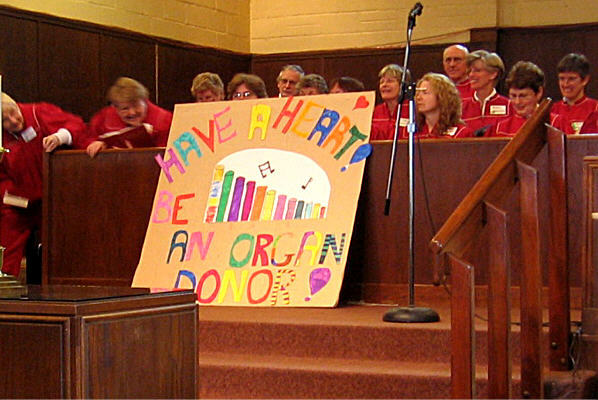 while Organ replacement committee chairman Keith Field looked on. Howard Clark and George Provias also took some time to check out the activity (and the amazing sounds). Finally Don had an opportunity to play a tune or two to check out his handiwork. 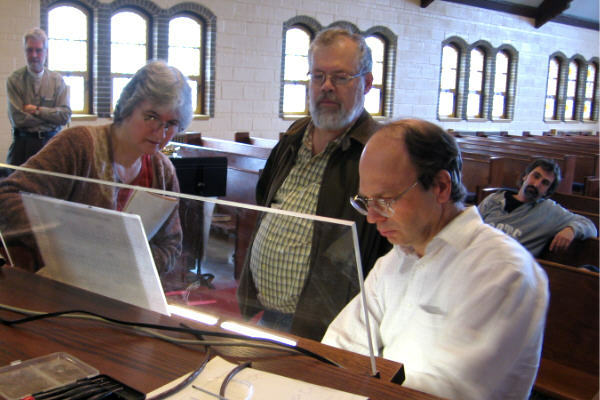 by playing a number of tunes in various configurations..
For some of the more complex numbers, Jim turned the pages. 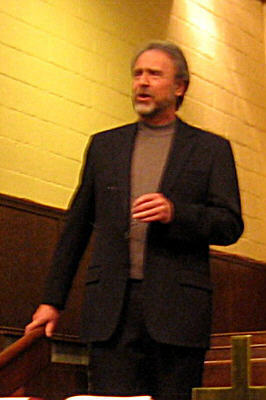 We tried to show Don's dancing feet, but a still photo does not capture the motion. 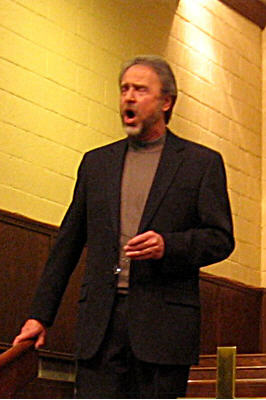 Jim is a trained opera singer, so he offered a couple of songs, accompanied by the organ. "Deh vieni alla Finestra", from Mozart's Don Giovanni, brought out some opera type emoting. 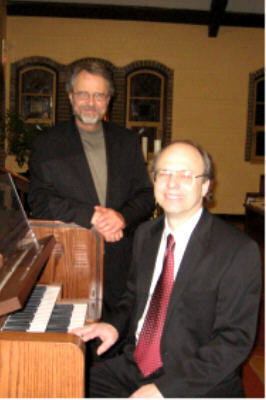 After the concert we caught a posed shot of Jim and Don before they headed off. 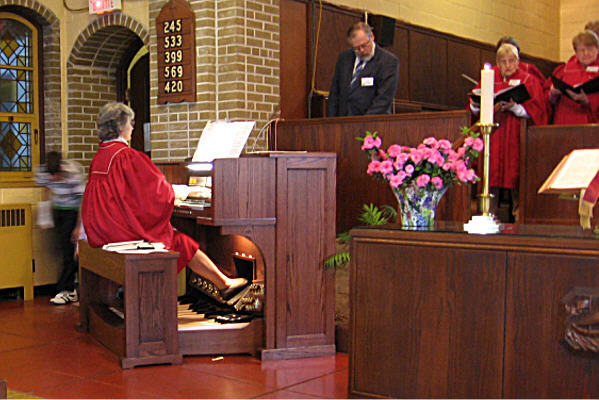 The dedication of the new organ took place during the April 29 Sunday service . with words modified for the occasion by Howard. that they have been filling in for the past couple of years. 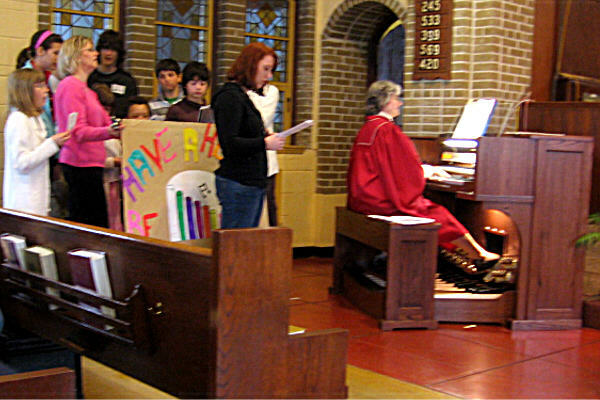 Connie asked the congregation to sing alternate verses of the anthem, with organ accompaniment. 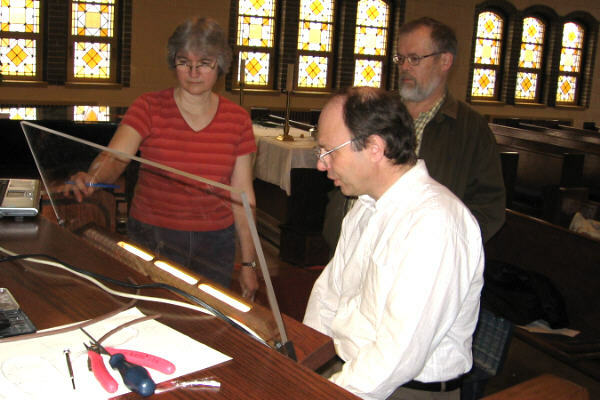 Keith Field (left) indicated when it was our turn to sing and Leslie Field (right) conducted us. 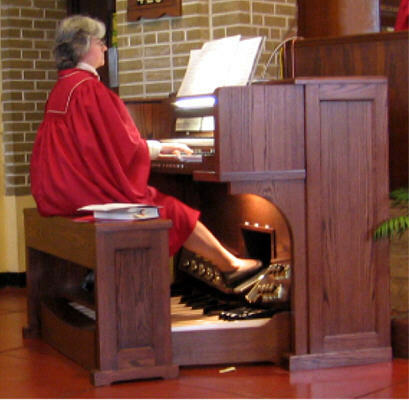 Connie on the postlude, both keyboards going and pedal to the metal. and to Sue McKenzie for organizing a young-at-heart dedication ceremony.